Unlike previous Garrett models, the first thing you will notice about the Garret AT Pro is how nice it looks, it’s been finished in a nice black, with grey buttons and silver rivets. No more of that bright yellow! Assembly is nice and simple and the AT Pro comes boxed in just a few parts. The Control box, the stem, the coil and a little wingnut that is used to secure the coil to the stem. 4 x AA batteries are placed inside the control box, with a simple twist an pull the battery compartment is released. A black sponge can be found on the hand grip and the forearm rest, which is then secured to your arm to balance the weight via a velcro strap. The headphones socket is located on the control box but headphones are not mandatory as the detector features an internal speaker. The stock coil that comes with the machine is 22cm x 28cm. As can be seen in the image of the Control box the Garrett AT Pro we have displayed the mode, the target ID number, discrimination segments, a depth indicator, battery level, ferrous and non-ferrous indication, sensitivity levels, Iron discrimination and Iron audio. 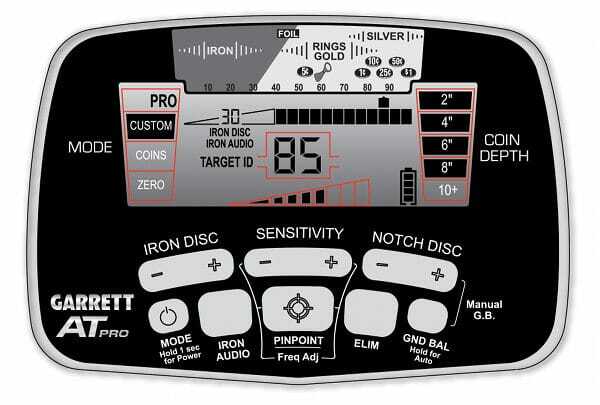 There are 8 buttons, iron discrimination, sensitivity, notch discrimination, mode & power, iron audio, Pinpoint mode/Frequency adjustment, elimination and ground balance. The modes allow us to toggle between different preset modes and even custom. The custom mode allows us to store our own preferences. Zero mode is the same as all metal with no discrimination. Coins mode Garrett have predefined to the best settings for coin shooting. Pro mode will take a little practice and is aimed at the more seasoned detectorist it gives a more detailed audio tone and will also give depth indication via audio. You will also get a clear indication of the size of the target. All in all the Garrett AT Pro has many of the features of more advanced expensive machines at a very low price. What does AT stand for in Garrett AT Pro? The AT in AT pro simply stands for all terrain which I believe is an area they have excelled in when designing the machine. Fully waterproof and submersible up to 10 feet. Please note though the headphones that come standard with the machine are not waterproof and you will need to upgrade them should you want to achieve this. A great upsell by Garrett slipped in. Now for some information on those Pro features Garrett has managed to cram into this fantastic metal detector. Iron Audio, when used will allow the user to hear the discriminated iron that is in the ground. Giving off a low dull tone. It will also save you missing a good target when it’s located near iron. Once you hit a good target it’s always worth flipping the iron audio on to get a more clear indication of the iron content. Allowing you to spend less time digging questionable signals. Ground Balance, always welcomed in my eyes. This will allow you to either manually or automatically set the ground balance. Helping the detector better understand the ground conditions. Useful when the ground is high in salt or highly mineralized. This feature allows us to cut out chatter from the machine and gives us a better target ID accuracy. Interchangeable coils, There are many coils available at extra cost for the Garrett AT Pro allowing us to change the way the detector behaves. Particularly useful for things like extra depth, covering more ground, gold hunting, water hunting etc. Pinpoint, This mode allows us to pinpoint the target when the mode is selected. Quite simply meaning the machine will align the target with the centre of the coil letting us recover the target with more speed and more efficiently. Using the Garrett AT Pro is more simple than you would think, I believe a complete novice could learn to use the machine in just a few days. However, it has all the features and performance to satisfy more advanced users. Weight wise it’s not the lightest of machines, so I would not recommend for children. Take it slow when swinging and you shouldn’t notice the nose heaviness. If you rush however this can make you ache a little after a full day. The 15khz single frequency of the machine is a tiny bit of a let down I feel, especially with other machines running multiple frequencies. However, it still performs great when locating smaller finds which is what they had in mind when they ran it at this frequency. The depth capability of the Garrett AT Pro depends on the conditions of the ground you are metal detecting on, however on a good day on good ground expect to find things deep. The depth indicator on the control panel shows a maximum of 10+ inches however I’ve seen small targets pulled out at anywhere between 12 and 14 inches! These settings are of my opinion and it does not necessarily mean that they will be the best settings for you. Again the optimum settings will highly depend on the ground you are hunting on. I personally set it to Zero disc, sensitivity as high as possible without the machine becoming unstable, and set the ground balance to around 72 – 76. Set it to Pro mode/Zero mode, set the iron discrimination to 30 and switch on the auto ground balance if you’re on the wet sand. You can manually set the ground balance on the dry sand for optimum performance. Just listen out for any chatter and adjust the ground balance and sensitivity accordingly. You can download a copy of the Garrett AT Pro Owners manual in PDF format here. 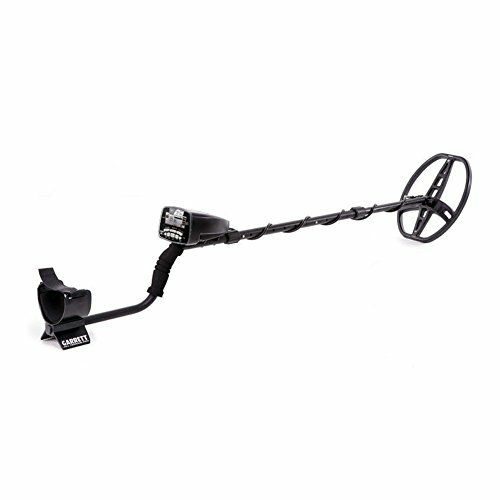 The Garrett AT Pro is a great all-round metal detector and is excellent value for money. With it being designed for all terrains it excels in all conditions. Whether you be in the middle of a field, 10 feet underwater or in highly mineralized conditions the machine will not let you down. Expect to make deep finds due to the iron audio. There are reports of making finds 12″ plus with this machine with some believing it will go even deeper. 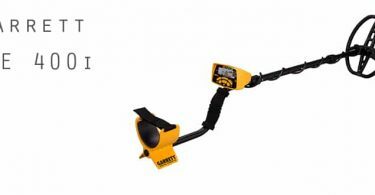 The PRO differentiates between different metals with ease and this metal detector will find a coin next to a nail. 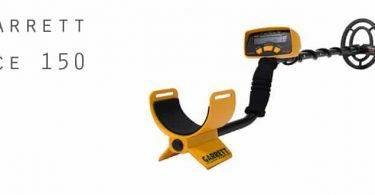 Garret’s AT PRO is an investment and an asset and will always be a welcomed part of your metal detecting arsenal. I would have liked to have seen multi frequencies and the waterproof headphones come as standard. However, for the money, you can’t complain you’re getting a whole lot of machine for the price. Expect to pay twice this amount for something as powerful. You can now also purchase the AT MAX for not much more price wise. In usual fashion, there is never anything too bad to say about a Garrett machine and I expect this is the number one reason for their longtime success. Stock Coil DD Proformance 8.5" x 11"